If you're like many of the people who come to us, you have a long list of questions you don't know how to answer. How do I prepare my land for construction? How do I obtain utility services? How much will it cost? How do I get a mortgage? Maybe you're even wondering, how do I find a piece of land in the first place? To all these questions we have a short, reassuring answer: we've got you covered. Cassio Homes has developed a step-by-step process that makes the homebuilding experience what it should be — predictable and enjoyable. We help you at every stage, from finding lots or land, finding the local school district in the area, shopping, business districts, even local restaurants near your new home. At Cassio Builders we are here to build a lasting Client-Builder relationship, not to just sell a home and leave you feeling stranded. The best part of being an on your lot builder is that we build your home on the location of your choice. You choose the site that most perfectly fulfills your dreams. Whether you always wanted to live in a rural setting, on a family farm, on a lake, in a development – we're here to help you build your custom dream home wherever you choose. Whether you currently own a site on which to build your new home, are narrowing down your options between multiple sites or are just getting started - we can help you through the custom home building process. Don't have your land yet? No problem! We're here to assist you in selecting the ideal piece of land. We'll help you take into consideration many things that can impact whether or not land is an ideal choice for your dream home. From grade and slope to investigating if there are restrictive covenants, lot dimensions home owners associations and fees, issues with drainage or springs, there are soil tests, you may be in a rural area where the site may require septic systems either standard or sand mound systems. 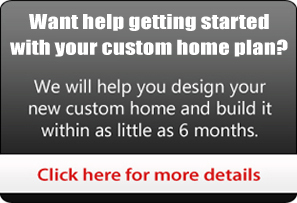 With our experience in land development, custom home building and financing we will assist you any way we can. Great! We want to build your home on your land - the way you want it. As a custom builder with more than 30 years of homebuilding experience, we know each lot has unique characteristics. Sometimes the design you have your heart set on doesn't fit within the lot dimensions. That's perfectly ok. We can discuss the design options that will work with your lot. With thousands of standard plans to choose from and each one customizable to fit your needs, we will work with you to make sure your home fits, and if we see a way to better design your home to fit your lot, we will make those suggestions. We can even help you develop your own custom plan to meet your expectations while staying within the building footprint on your property. One quick tip - the best approach is to design your home to fit the lot, it is more cost effective than building a lot around your home. We would be happy to come out and do a free home site evaluation. If you don't have land yet, this could be a great way to make sure you are selecting a piece of property that not only meets your tastes but will also work with the home design to keep you within your desired budget. We will meet you at the site and answer questions like how your home will be positioned on the lot, evaluate what site work may be needed, what trees will need to be cleared, what utilities are available, etc to help determine the development costs required to build your custom dream home. Contact us to schedule your free service today! Most of our home owners choose a one-time closing since you only have one set of closing costs. This combines the cost of your land and the cost of your new custom home. Or, if you own your land, you can use the equity towards the down payment. Keep in mind, you do not have to pay off the lot first - the lot and home can be combined into one mortgage. You can view some of what our recommended lenders can offer you over at our financing page. Or, you can Contact us to share your needs with us and we will help narrow down the most appropriate lenders to get started with today!